Odis Waggoner and his twin sister Deloris were born in Burns, Indiana, on 22 October 1924. Their parents, Curtis and Verna Dowden Waggoner, owned and operated a farm six miles from town. Their chief product was corn but like most farms of that era they grew other crops and raised various animals. Additional income was brought in by making molasses during the summer and maple syrup in the wintertime. Odis, Deloris and their two older sisters Beulah and Zelma spent most of their childhood either sudying in school or doing chores on the farm. Obviously Odis was a good student as he graduated from Burns City High School in the spring of 1941 at the young age of sixteen. He was barely seventeen when the Japanese bombed Pearl Harbor, so he needed to wait another year before he could honestly register for the draft. Come March of 1943, Odis received his draft notice. At first he was slated for the Navy, but he was able to talk his way into the Army, not wanting to be confined and cramped on a ship. Without telling him, the Army put him in the Army Air Corps. His training days were rather quick. After undergoing Basic Training, Aircraft Mechanics School and Aerial Gunnery School, Odis was deemed ready to be assigned to a combat crew as a Flight Engineer. Although he was assigned to the Vowinkel Crew in Salt Lake City, they weren't assembled together until late February 1944 at the 331st Combat Crew Training School in Casper, Wyoming. The Vowinkel Crew trained on B-24s until May. Then they were given a brand new one to ferry over to England. Prior to leaving, the crew was first sent to McCook, Nebraska, where they did some more training. Like with many replacement crews, additional training time was ordered whenever the big boys needed time to decide where to send them. Before the month's end, they were scheduled for deployment to the ETO, European Theatre of Operations. While the Normandy Invasion forces were fighting their way inland, the Vowinkel Crew flew the Northern route to the United Kingdom. After additional schooling on intelligence, aircraft recognition, and gunnery training, they received their assignment to the 467th BG at Rackheath. Three days after settling in with the 467th, they received new orders reassigning them to the 492nd BG. The scuttlebutt was that the 492nd had recently lost a large number of planes and despirately needed more replacement crews in a hurry. Upon arrival to North Pickenham, the Vowinkel Crew was assigned to the 856th Bomb Squadron. They missed all of the tough air battles the 492nd had fought with the Luftwaffe, but they were in time to experience first-hand some of the heaviest flak ever seen by any group throughout the war. Odis recounts his daylight bombing missions, revealing some of the hardships and close calls they endured. A link to his story is found at right. See: "World War II Memories of Odis F Waggoner." After Odis flew eight combat missions, the 492nd was disbanded due to high casualties. The Vowinkel nine-man Crew was transferred to the 36th BS. Flying with the 36th BS was radically different than those with the 492nd BG, but was just as important. This was a provisional outfit which flew special planes equipted for jamming German radar. Their results saved a countless number of Allied soldiers, yet hardly anyone knew about them. The 36th BS, aka the GREMLINS, and its equipment was top secret and remained classified for many decades after the war. Most of Odis' forty-one jamming missions were flown at night in support of the RAF bombers. While these missions weren't counted the same as bombing missions, they were just as dangerous, as they often flew alone over enemy territory. A full tour required flying fifty missions. Additional details are found in his story, linked at right. When the Vowinkel Crew completed their tour, the crew was split up and during March 1945 Odis was sent back to the states. Since the war was not over in any of the theaters, it was uncertain where Odis would end up. After spending his three week furlough visiting his home, he was sent to Santa Ana, California, for further assignment. They sent him to Chanute Field, Illinois, to attend a school on Pratt & Whitney engines. Upon completion, he was transferred to Las Vegas Army Air Field to work as an engine mechanic. He remained stateside for the rest of the war. By August the war was over and Odis got his notice to be discharged from service at Camp Atterbury, Indiana. 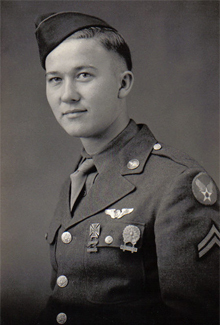 Tech Sergeant Odis Waggoner was honorably discharged on 17 September 1945 having flown 49 missions earning him the EAME Theater Ribbon with 5 bronze stars (battle stars), the Good Conduct Ribbon, and the Air Medal with 5 Oak Leaf Clusters. One amusing story Odis tells is when he joined the American Legion shortly after his discharge. After he had told them he flew combat missions with the 8th Air Force, they questioned if flyboys were qualified to be called combat veterans. Shortly after getting home, Odis found a civilian job with the Navy Muntions Depot at Crane, Indiana. In 1961 the munitions depot was relocated to Mechanicsburg, Pennsylvania, and Odis went with them. He retired in 1977 from the one and only civilian job he ever had. Fours years later his twin sister talked him into moving near her in Odon, Indiana. Odis lived there, enjoying his retirement with friends and relatives, until his death on 7 October 2009. He was active in the American Legion and VFW to the very end. Although it was physically difficult for him at times to stand in the rain and cold, he proudly served as flag bearer in the honor guard ceremonies for area veterans' funerals because it was important to him that their service be recognized and honored. Odis is the proud father of two sons. The oldest, Tom, lives in Safford, Arizona, while Bob has a home in Albuquerque, New Mexico. The latter is a retired Air Force captain.